Aggregate gross gaming revenue (GGR) from commercial casinos in the United States in 2017 continued to be higher than the yearly tally in Macau, indicated data released in the U.S. on Wednesday. It was the third consecutive year that Macau’s casino industry trailed the U.S. commercial casino industry. According to “State of the States: The AGA Survey of the Commercial Casino Industry,” published by the casino industry lobby group the American Gaming Association (AGA), total commercial casino GGR – i.e. excluding tribal gaming – amounted to just under US$40.28 billion in 2017. It represented an increase of nearly 3.4 percent judged year-on-year. As cited in the report, 24 U.S. states permit such business. Annual tribal casino revenue in the U.S. accounted for a further US$32.40 billion in 2017 – an expansion of 3.9 percent year-on-year – according to data from the National Indian Gaming Commission cited by AGA in the latter’s report. In Macau that year, total casino GGR was MOP265.74 billion (US$32.87 billion at current exchange rates), but the year-on-year growth rate was 19.1 percent, showed Macau government data. Macau’s casino industry first surpassed the U.S. commercial casino industry in terms of gross gaming revenue in 2012. It kept the lead – and even widened the gap – in the following two years. The situation reversed with effect from mid-2014, as Macau began recording year-on-year declines in monthly gross gaming revenue, which some investment analysts linked to mainland China’s anti-corruption campaign. Annual casino gross gaming revenue in Macau only returned to year-on-year growth in 2017, after three consecutive years of annual decline. Direct gaming tax from U.S. commercial casinos in 2017 amounted to US$9.23 billion, representing 23 percent of commercial casino GGR; versus Macau’s effective 39 percent tax on casino GGR. But U.S. commercial casino gaming is also subject to other taxes including on player winnings. The top-three U.S. commercial casino markets in 2017 by GGR in descending order were: the Las Vegas Strip (pictured), Nevada, with US$6.46 billion; Atlantic City, New Jersey, with US$2.41 billion; and “Chicagoland” – encompassing parts of Illinois and Indiana in the greater Chicago area, with US$1.97 billion. The AGA report made reference to Resorts World Las Vegas – a project planned for the Nevada gaming hub by Malaysia’s Genting group, and which has been trailed as likely to appeal to Asian gamblers. “Although various non-gaming entertainment amenities are under development in Las Vegas, the competitive environment for operators is expected to remain largely stable until 2020. 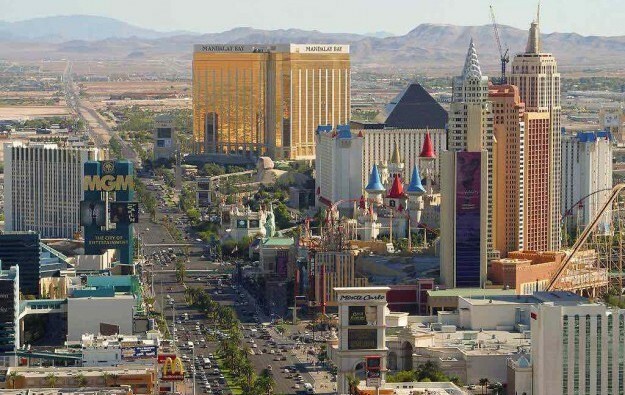 That is the year two major resort casinos on the north end of the Strip – the US$4 billion Asian-themed Resorts World Las Vegas and the long-stalled Fontainebleau project – could be completed,” said the document.